I have a new freebie script for you to play with. 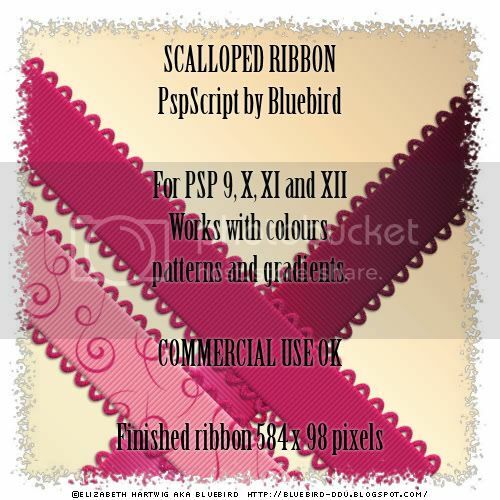 It's a simple little scalloped ribbon with no outside filters required. Hope you like it. Thank you! Your blog post will be advertised on the DigiFree Digital Scrapbooking Freebie search engine today (look for timestamp: 03 Jan [LA 09:16pm] - 04 Jan [NY 12:16am, UK 05:16am, OZ 04:16pm] ). Thanks so much for a freebie script. It's very appreciated. Thank you so much for this Freebie. I want to let you know that I posted a link to your blog in Creative Busy Hands Scrapbook Freebies Search List, under the Commercial Use Ok post on Jan. 04, 2009. Please, notice that I've changed my url. Thanks again and Happy New Year. Thanks for this useful script, it comes in handy. Thank you so much. I am lerning PSP, so these will be very helpful. Thanks so much, the script works beautifully. Just to say ty for sharing your amazing talent. This is so so cute! !